"The master vampire is dead the world's most powerful shifter is out of a job"
Andy is the Carus, a shifter who has the ability to shift between numerous animals and create a beast that is more powerful than any other. She hides these abilities from the SRD (Supernatural Regulatory Division) or she will end up a government lab rat. Andy wakes from her sleep to the news that master vampire Lucien has been killed. The initial shock of his death brings fear that her ex- boyfriend Wick died at the same time because Wick was Lucian's wolf to call. Now Andy is not only out of a job, as Ambassador between the vampires and the SRD, but must discover what or who could have possibly killed the master vampire of the city. As Andy begins her investigation her boyfriend Tristan is strangely busy and disappears for a while, returning with information that could destroy their relationship at a time when her reason for ending things with Wick have come out. In SHIFT WORK Andy is put to the test. She must make decisions that have serious impact, not only on her life but the lives of those around her and the world at large. Something strange is going on and she must stop it before humanity is changed forever. I love the Carus series by J.C. McKenzie. Andy is a strong woman who has lived through some very difficult times to get where she is, and it has cost her much. Yet she never stops fighting for what is right and to save those close to her. 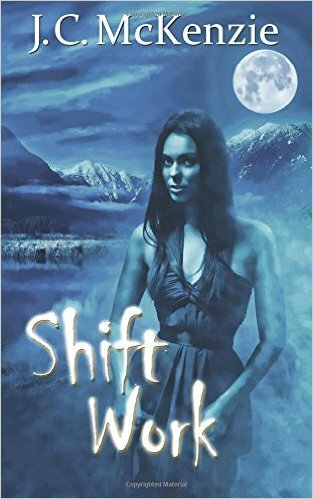 You have to read the whole series, and I suggest picking up SHIFT HAPPENS, book one, and spending a few days of pure pleasure reading each in the series. But when all else fails don't miss SHIFT WORK by J.C. McKenzie. Badass Shifter Andy McNeilly is running on empty. The death of a prominent supernatural being has her reeling. The invention of a new street drug has the police knocking on her door for assistance. And a friend needs her unique skills to help investigate a messy murder. In the interest of paying the bills, paying it forward, and keeping the Supernatural Regulatory Division off her back, Andy once again slips through the dark streets of Vancouver�s seedy underworld. In the process, she uncovers secrets that threaten to derail her love life and her investigation. Can Andy capture a murderer, solve a mystery, and forgive her lover�s past? Or will the grime of the criminal world swallow her whole?